Fossil expert says ... think weird! 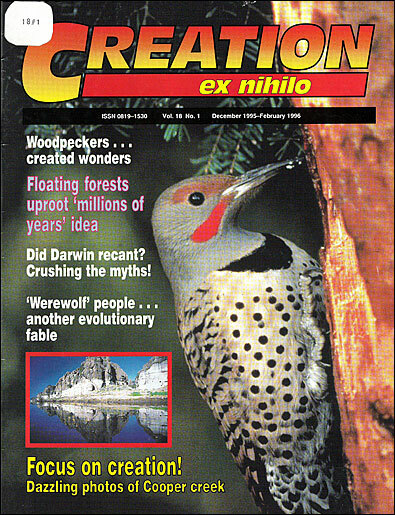 Can 'thinking weird' help creationists? Dr Kurt Wise believes so, and he encourages his students to break new ground in their thinking by doing just that. What is 'thinking weird'? Dr Wise believes that most of us have been trained to be biased towards thinking in an evolutionary way, which unfortunately is not along the lines of God's thinking. So he encourages his students to look at their starting assumptions, and to think about whether those assumptions are correct, or whether there are other options they need to consider. To illustrate, he says that when God recreates us with a new spirit, He creates us spiritually complete. That certainly doesn't mean he believes creation is a theory. As someone trained in science at Harvard—one of the world's leading universities—how does Dr Wise respond to evolutionists who might accuse him of starting scientific investigations within the constraints of his belief in the Bible? Shouldn't science follow truth wherever it may lead? For Dr Wise, the authority of the Bible is non-negotiable. He received Christ when he was nine years old, and maintained the absolute truth of Scripture throughout his school years. At one stage he even took a pair of scissors to a Bible, and started cutting out the sections which would have to be discarded if evolution was true, with its long ages for the earth. He found that there wouldn't be enough of the Bible left for it to hold together. 'To accept the entire evolutionary model would mean one would have to reject Scripture. And because I came to know Christ through Scripture I couldn't reject it.' At that point he decided his only option was to reject evolutionary theory. Dr Wise's interest in fossils began when he was very young. Every time Christmas or his birthday rolled around his father gave him a gift that would expand his knowledge. On one occasion his father gave him a telescope. On another it was a microscope. And so on. He had 36 hobbies and collections by the time he graduated from high school. And what about that interest in fossils? 'One of the things my father gave me was a little book on fossils. I read that, and ran upstairs to my Dad and said, "Hey, it says here you can go to gravel pits and collect fossils". Apart from evolution, Dr Wise says that one of the things that has really bothered him is finding creationists who fall into the trap of dismissing justified criticism. He said he has presented data to point out areas that some of them needed to change, and it was either fobbed off or was still being repeated next time he saw them. He believes that this may be why he has a reputation for being critical of creationists, or even why some have accused him of being a 'closet evolutionist'. But he says he simply has an extremely high regard for the truth. He is concerned that there are 'creationists' around who, because of their understanding of particular scientific issues, deviate from the scriptural foundation promoted so strongly by Dr Henry Morris, for example. Dr Wise surprised many creationists by earning his Ph.D. under the tutelage of noted evolutionary palaeontologist Stephen Jay Gould, a very harsh critic of creationists. Dr Wise says of Professor Gould, 'He's a libertarian at heart', and thinks that at least some of Gould's criticisms have been justified because of the statements of some ill-informed creationist writers. Professor Gould is said to be very interested in people who show they can do good science, even if they have differing beliefs. Among positive trends in creationism, Dr Wise sees the four-yearly International Conference on Creationism in Pittsburgh as extremely encouraging. He also regards the continual improvement of the Creation Ex Nihilo Technical Journal as exciting. He is pleased to see the trend towards a presuppositional approach to the presentation of creationism (as opposed to the 'evidential' approach). Dr Wise says he is encouraged at seeing an increase in the number of creationist graduate students who are receiving advanced degrees, and who will be able to help build the creationist model. He says the time of the 'lone wolf' creationist is past, where one lone creationist is out trying to attack evolution on his own. In this vein, he is always looking for ways to bring researchers from different fields together, and to get groups working on improving the creation model. At present, one of his undertakings is an in-depth Flood model project with Drs Andrew Snelling, Steve Austin, John Baumgardner, Russell Humphreys, and Larry Vardiman. In light of his experience in teaching and research, does he have any advice for students reading this article who are thinking of entering a science field? And that's really not such 'weird thinking'!